Sophomore Raign Estes exhibits her self imposed tattoos. 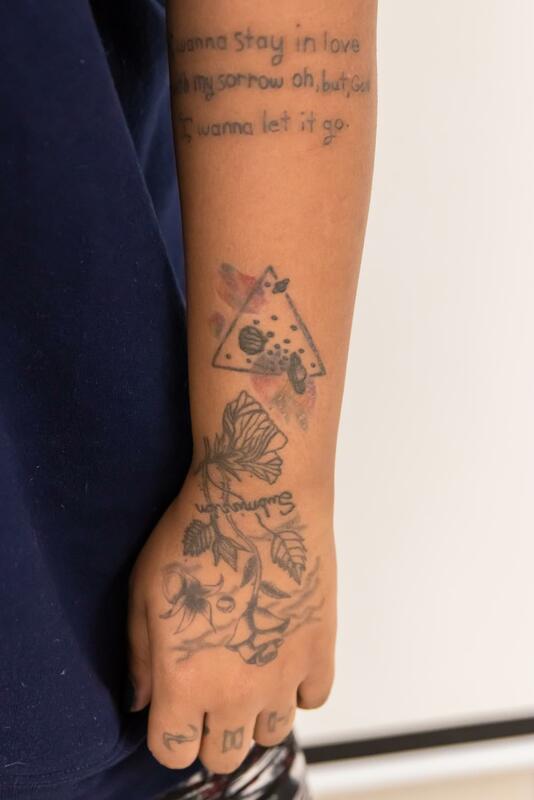 She gave herself her first tattoo the summer before sophomore year at age 15 in her own home. "I love [my tattoos], but every time I tattoo myself, I kind of get in front of the mirror and check it out and say I need more," Estes said. "I learned to appreciate that those tattoos are more than just an image and they're an experience for me. I'll always remember the feeling of tattooing them on myself, the process of tattooing them and the time that I did it. I could probably look at each of these tattoos and go back to a day that I did them." I wanna stay in love with my sorrow, oh, but, God I wanna let it go. For some people, these words are nothing more than Evanescence song lyrics. But for sophomore Temper Raign Jetamio Estes — who was diagnosed with clinical depression in middle school — they’re much more. Estes never wanted to forget those words that she instantaneously connected with for as long as she lived. To ensure their permanence, she tattooed them onto her forearm, using a tattoo gun and ink from a professional kit her mom purchased for her from a tattoo artist online. 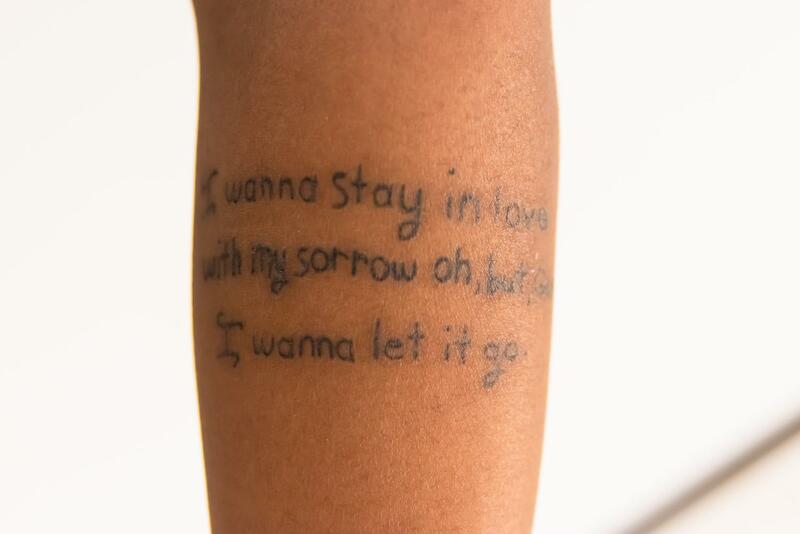 The lyrics make up only one of the 22 tattoos Estes has given herself. From an early age, Estes drew and doodled on a daily basis. Her interest in tattoo artistry, however, first sparked after she was mesmerized by the scorpio tattooed on her father’s shoulder and her mom’s name tattooed on his neck. After her mom bought her the kit, Estes started practicing on fake skin, and eventually moved to her own arms, fingers and knees. From song lyrics to the chemical formula for depression, each of Estes’s tattoos has some type of meaning behind it. The roman numerals on her wrist are the numerical translation of the word, “music.” The markings on her knuckles are symbols of all of the bands she listened to during her depression. The word, “paradise,” tattooed on the side of her left arm, is another Evanescence song lyric, representing the utopia that Estes yearns to find after she dies. Estes considers the pain to be a part of the learning process. Estes feels fortunate that she hasn’t been discouraged by any of her peers or family members to pursue her passion for tattoo artistry. 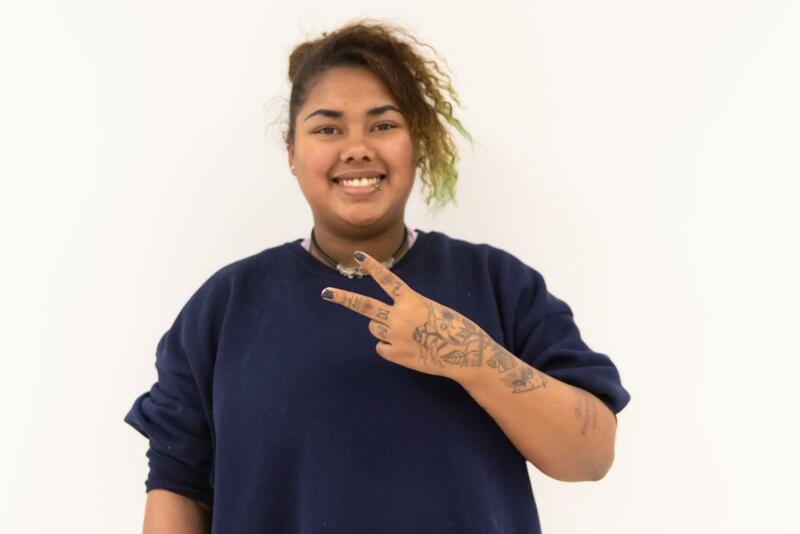 Her ultimate plan is to cover her entire body with tattoos, graduate from a college that offers tattooing courses, apprentice at a tattoo shop and open her own tattoo parlor.